Victoria Falls, or Mosi-oa-TunyaTonga: the Smoke that Thunders), is a waterfall in southern Africa on the Zambezi River at the border of Zambia and Zimbabwe. David Livingstone, the Scottish missionary and explorer, is believed to have been the first European to view Victoria Falls on 16 November 1855 from what is now known as Livingstone Island, one of two land masses in the middle of the river, immediately upstream from the falls on the Zambian side. Livingstone named his discovery in honour of Queen Victoria of Britain, but the indigenous name, Mosi-oa-Tunya—"the smoke that thunders"—continues in common usage as well. The nearby national park in Zambia is named Mosi-oa-Tunya, whereas the national park and town on the Zimbabwean shore are both named Victoria Falls. The World Heritage List officially recognizes both names. While it is neither the highest nor the widest waterfall in the world, it is classified as the largest, based on its combined width of 1,708 metres (5,604 ft) and height of 108 metres (354 ft), resulting in the world's largest sheet of falling water. Victoria Falls is roughly twice the height of North America's Niagara Falls and well over twice the width of its Horseshoe Falls. In height and width Victoria Falls is rivalled only by Argentina and Brazil's Iguazu Falls. See table for comparisons. The falls have already started cutting back the next major gorge, at the dip in one side of the "Devil's Cataract" (also known as "Leaping Waters") section of the falls. This is not actually a north-south crack, but a large east-northeast line of weakness across the river, where the next full-width falls will eventually form. Archaeological sites around the falls have yielded Homo habilis stone artifacts from 3 million years ago, 50,000-year-old Middle Stone Age tools and Late Stone Age (10,000 and 2,000 years ago) weapons, adornments and digging tools. Iron-using Khoisan hunter-gatherers displaced these Stone Age people and in turn were displaced by Bantu tribes such as the southern Tonga people known as the Batoka/Tokalea, who called the falls Shungu na mutitima. The Matabele, later arrivals, named them aManz' aThunqayo, and the Batswana and Makololo (whose language is used by the Lozi people) call them Mosi-o-Tunya. All these names mean essentially "the smoke that thunders". A map from c. 1750 drawn by Jacques Nicolas Bellin for Abbé Antoine François Prevost d'Exiles marks the falls as "cataractes" and notes a settlement to the north of the Zambezi as being friendly with the Portuguese at the time. Earlier still Nicolas de Fer's 1715 map of southern Africa has the fall clearly marked in the correct position. It also has dotted lines denoting trade routes that David Livingstone followed 140 years later. 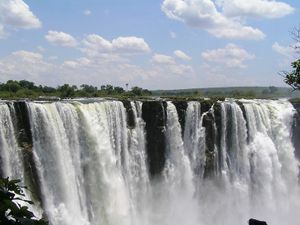 The first European to see the falls was David Livingstone on 17 November 1855, during his 1852–56 journey from the upper Zambezi to the mouth of the river. The falls were well known to local tribes, and Voortrekker hunters may have known of them, as may the Arabs under a name equivalent to "the end of the world". Europeans were sceptical of their reports, perhaps thinking that the lack of mountains and valleys on the plateau made a large falls unlikely. In 1860, Livingstone returned to the area and made a detailed study of the falls with John Kirk. Other early European visitors included Portuguese explorer Serpa Pinto, Czech explorer Emil Holub, who made the first detailed plan of the falls and its surroundings in 1875 (published in 1880), and British artist Thomas Baines, who executed some of the earliest paintings of the falls. Until the area was opened up by the building of the railway in 1905, though, the falls were seldom visited by other Europeans. Nonetherless, many writers still believe that it was the Portuguese priest Gonçalo da Silveira the first European to catch sight of the falls back in the seventeenth century. European settlement of the Victoria Falls area started around 1900 in response to the desire of Cecil Rhodes' British South Africa Company for mineral rights and imperial rule north of the Zambezi, and the exploitation of other natural resources such as timber forests north-east of the falls, and ivory and animal skins. Before 1905, the river was crossed above the falls at the Old Drift, by dugout canoe or a barge towed across with a steel cable. 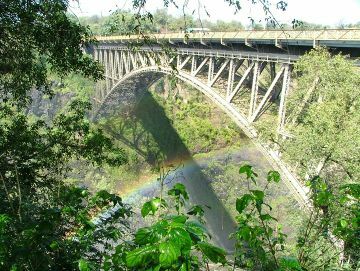 Rhodes' vision of a Cape-Cairo railway drove plans for the first bridge across the Zambezi and he insisted it be built where the spray from the falls would fall on passing trains, so the site at the Second Gorge was chosen. 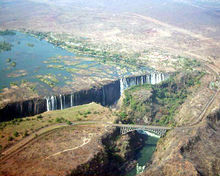 See the main article Victoria Falls Bridge for details. From 1905 the railway offered accessible travel to whites from as far as the Cape in the south and from 1909, as far as the Belgian Congo in the north. In 1904 the Victoria Falls Hotel was opened to accommodate visitors arriving on the new railway. 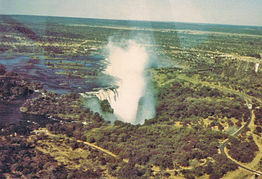 The falls became an increasingly popular attraction during British colonial rule of Northern Rhodesia (Zambia) and Southern Rhodesia (Zimbabwe), with the town of Victoria Falls becoming the main tourist centre. In 1964, Northern Rhodesia became the independent state of Zambia. The following year, Rhodesia unilaterally declared independence. This was not recognized by Zambia, the United Kingdom nor the vast majority of states and led to United Nations-mandated sanctions. In response to the emerging crisis, in 1966 Zambia restricted or stopped border crossings; it did not re-open the border completely until 1980. Guerilla warfare arose on the southern side of the Zambezi from 1972: the Rhodesian Bush War. Visitor numbers began to drop, particularly on the Rhodesian side. 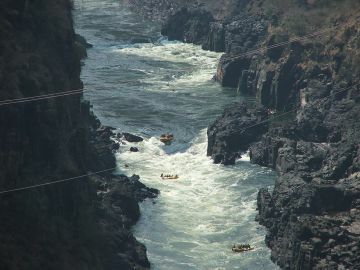 The war affected Zambia through military incursions, causing the latter to impose security measures including the stationing of soldiers to restrict access to the gorges and some parts of the falls. The two countries permit tourists to make day trips from each side and visas can be obtained at both border posts. Costs vary from US$45-US$80 (as of 1 December 2013[update]). Visitors with single entry visas are required to purchase a visa each time they cross the border. Frequent changes in visa regulations mean visitors should check the rules before crossing the border. 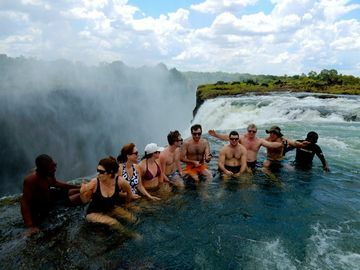 The two national parks at the falls are relatively small—Mosi-oa-Tunya National Park is 66 square kilometres (16,309 acres) and Victoria Falls National Park is 23 square kilometres (5,683 acres). However, next to the latter on the southern bank is the Zambezi National Park, extending 40 kilometres (25 mi) west along the river. Animals can move between the two Zimbabwean parks and can also reach Matetsi Safari Area, Kazuma Pan National Park and Hwange National Park to the south. The national parks contain abundant wildlife including sizable populations of elephant, buffalo, giraffe, Grant's zebra, and a variety of antelope. Katanga lions, African leopards and South African cheetahs are only occasionally seen. Vervet monkeys and baboons are common. The river above the falls contains large populations of hippopotamus and crocodile. African bush elephants cross the river in the dry season at particular crossing points. 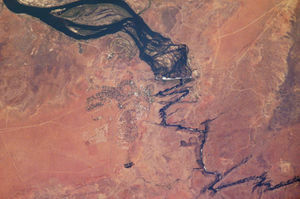 ↑ 9.0 9.1 9.2 9.3 9.4 World Commission on Dams website: "Case Study — Kariba Dam-Zambezi River Basin" Annex 13 & 14 Victoria Falls Mean Monthly Flows. Website accessed 1 March 2007. This website gives mean monthly flow rates in cubic metres per second (i.e., the total volume of water passing in each calendar month divided by the number of seconds in the month), the standard measure used in hydrology to indicate seasonal variation in flow. A figure of around 9,000 m3/s (318,000 cu ft) is quoted by many websites for Victoria Falls but this is the mean maximum instantaneous rate, which is only achieved for a little amount of days per year. The figure of 536 million m3/minute (18.9 billion cu ft/min) on some websites (e.g. ZNTB) is an error for 536 million litres/minute (equivalent to 9100 m3/s or 142 million U.S. gallons/min). The '10-year maximum' is the mean of the maximum monthly rate returned in a ten-year period. ↑ 11.0 11.1 11.2 11.3 11.4 11.5 11.6 United Nations Environment Programme: Protected Areas and World Heritage World Conservation Monitoring Centre. Website accessed 1 March 2007. ↑ The Northern Rhodesia Journal online: "Native Name of Victoria Falls", Vol I No 6 pp68 (1952). Accessed February 28, 2007. ↑ Agter die Magalies": "Agter Die Magalies" B.K. de Beer, pp43–44 (1975) Postma Publications. Accessed September 1, 2007. ↑ The international service of Czech Radio online: "Statue of explorer Emil Holub unveiled in Livingstone, Zambia" accessed 28 February 2007. ↑ Eric Anderson Walker. The Cambridge History of the British Empire, volume 2.. CUP Archive, 1963. Retrieved 4th October 2015. ↑ 20.0 20.1 S Hanyona: "Zambia's Ecotourism Venture Clouded by Ecotroubles." March 5, 2002. ENS website accessed 9 March 2007. This page was last edited on 12 September 2016, at 15:24.